Coal fuels more than 30 per cent of UK electricity production, and about 50 per cent in the US, providing a significant portion of total energy output. China and India's recent ferocious economic growth has been based almost entirely on coal-generated electricity. Coal currently looks like a solution to many of our fast-growing energy problems. However, while coal advocates are urging us full steam ahead, the increasing reliance on this dirtiest of all fossil fuels has crucial implications for energy policy, pollution levels, the global climate, world economy and geopolitics. Cost – the quality of produced coal is declining, while the expense of transportation is rising, leading to spiralling costs and increasing shortages. Climate impacts – our ability to deal with the historic challenge of climate change may hinge on reducing coal consumption in future years. Blackout goes to the heart of the tough energy questions that will dominate every sphere of public policy throughout the first half of this century. It is critical reading for planners, educators and anyone concerned about energy security, oil depletion and climate change. 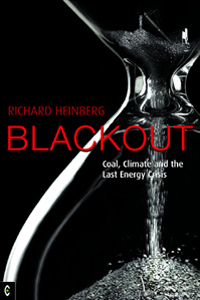 RICHARD HEINBERG is widely regarded as one of the world's foremost Peak Oil educators. A journalist and musician, he has lectured widely, appearing on national radio and television in many countries. He is a member of the core faculty at New College of California and Research Fellow of the Post Carbon Institute. His monthly Museletter has been in publication since 1992, and he is an award-winning author of seven books. Richard lives with his wife in a suburban home they have renovated for energy efficiency, where they grow much of their own food.